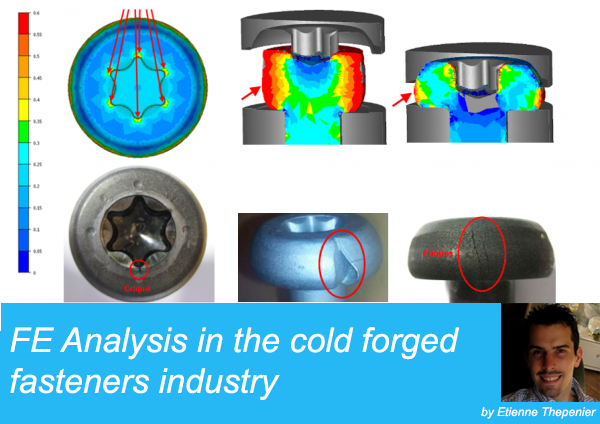 Today’s article has been generously written by Etienne Thepenier, who wanted to share his experience on cold forged fastener simulation using FEA. Here is Etienne’s Linkedin if you wish to contact him. Forging is a manufacturing process, which shapes work pieces by applying compressive forces onto them, using hammers or presses. The processes are generally classified into two main families according to materials forged and the forging temperature. – “Cold” forging deforms metal while it is below its re-crystallization point. – Over this point, the process is named “hot” forging. Finite Element Method (FEM) is used to model products in virtual environments. In the forging industry, this method is used to solve various kinds of studies, for example; new product validation, forging cycles design, presses tooling design and optimization, parts quality improvements, R&D, etc. In the following, I will present to you the reliability of this tool with some examples of the activities I perform as an R&D engineer in a cold forging company which manufactures fasteners for the automotive industry. The Finite Element Method is an approximate numerical calculation method that solves partial differential equations of models divided into mesh elements and nodes. Parts to be analyzed are divided into several elements, connected by nodes; this is the meshing operation. These nodes are like a glue that combine all of the elements into one assembly. The physical behaviour of each element is defined by algebraic equations. The number of these equations is very large (thousands, millions). The use of a computer is essential. The quality of the results (outputs) depend directly on the input quality. It has to be increased by constant team work which requires permanent feedback from the manufacturing services (including forged parts measurements), and an optimization of the numerical models parameters (friction coefficient, etc). For example, when I have to suppress a defect on a part, my first goal is to model the current forging cycle to obtain the “same” defect from FEM. Only after this, I can work on various proposals to remove it. See below, some examples of chaotic results obtained by FEM in order to validate the numerical models. – Define preliminary forging cycles, kinds of tooling and machines to be used. During the quotation step, FEM can be used to validate or invalidate the feasibility of complex parts. FEM is very helpful in pre-validating shapes and dimensional tolerances proactively with our customers, to provide them with a guarantee of the best parts quality and quickest delivery times, while optimizing our own productivity. FEM also allows us to increase our credibility and improves risk management. – Define the optimal cold forging cycle and the press to be used. – Define materials to be used (on parts and tooling). After having obtained a customer order for a complex part, FEM is then used to design the optimal forging cycle and tooling presses. During this step, each part and press tooling parameter is checked to prevent parts defects and tooling damage. Using FEM on this step improves our risk management and productivity by reducing lead-times and tooling costs. – Parts defects: cracks, folds, etc. Goal: – Define materials / cold forging ranges to defects (cracks, bending, lacks, etc.) For various reasons, some defects can appear randomly on forged parts. In this case, FEM is use to understand the phenomena and remove defects such as cracks, rafters, folds, lacks of material, non-conforming shapes, etc. This type of study increases the productivity and reduces scrap and sorting costs. and sorting costs. – Design parts to fit functional requirements. – Understand part breaks/defects and propose new designs to fit functional requirements. FEM can also be used to design screws in order to pre-validate these in work conditions and/or to estimate their limits. On the example below, the C1 dimension was originally too thin, so the washer and the screw flange were permanently deformed before the shank break, which is not allowed. FEM was used to define and validate a new C1 dimension. As presented above, FEM in cold forging can be used for many kinds of studies. – It allows testing and optimizing various technical solutions. – It reduces test tooling manufacturing costs. – It reduces the lead-time. – It is used to suppress part defects: cracks, folds, material lacks, etc. – It is used as a continuous improvement tool to optimize the manufacturing process. – It increases our customer confidence. – It allows us to penetrate new markets. – It optimizes product quality to meet customer requirements. – It performs the stress localizations. – It improves the presses equilibrium. – It designs the pre-loaded tools. Thank you for reading this study about FEM usage in the cold forging industry, I hope it was beneficial to you! “choose the Right FEA software” are not working. Gives “ internet explorer has stopped working “ error. I used too much time for correct it. No result. for sure it is not my computer problem. It is so good article. Please fix demonstration error. thanks for sending such good article. I corrected the first video, let me know if it works now. Can you let me know by email other things that are not working?